Way back in 2011, the Libraries began a partnership with the Institute for Microfilmed Hebrew Manuscripts (IMHM) at the National Library of Israel (NLI) to digitize over 200 manuscripts from our Judaica collection that the IMHM did not have in microfilm. 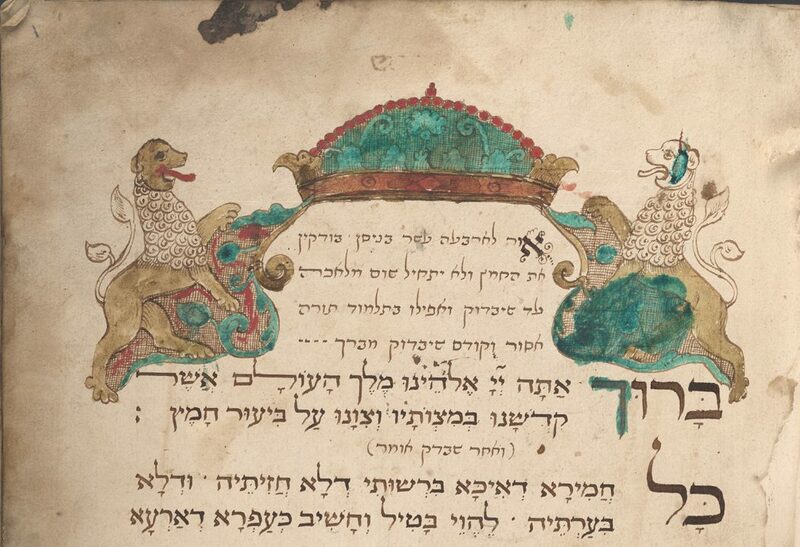 We subsequently posted those manuscript images on a specialized site on the Internet Archive, and in the NLI’s KTIV database of Hebrew manuscripts (which, to date, holds records, and in many cases digitized images, for 81% of the world’s known Hebrew manuscripts). 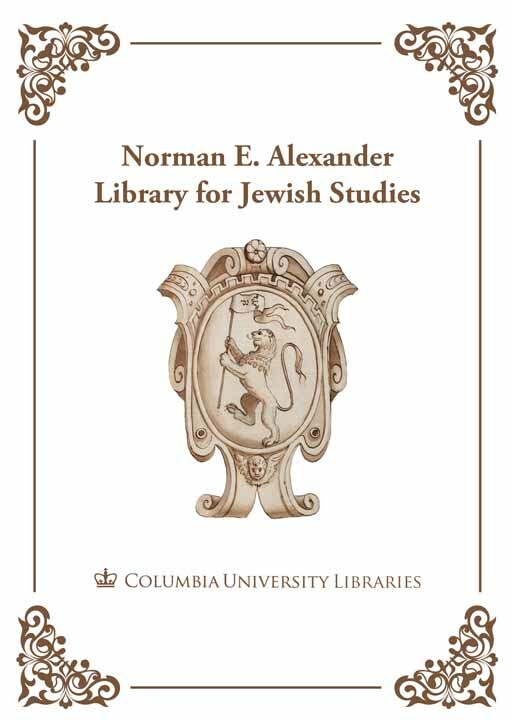 Over the course of the past year, Columbia University Libraries made the decision to make our collection further accessible, by digitizing all of the microfilm for the Hebrew manuscripts. The images were almost immediately loaded into KTIV (they will be added to our Internet Archive site as well), providing freely available images of over 1400 of our nearly 1700 manuscript titles to users around the world. Digitizing the microfilm and providing easy access the manuscripts is useful at many levels – the manuscripts are essentially browseable now in a way that previously would have taken months. 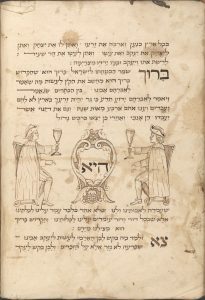 In browsing through thousands upon thousands of images, I stumbled across a Haggadah that looked quite interesting, with lovely illustrations of the Passover Seder. While black and white microfilm images don’t do justice to an original, they can serve as a first step to learning about important manuscripts. After looking at the images of what looked like a series of prayers for various holidays, I went to look at the original manuscript, and was not disappointed. 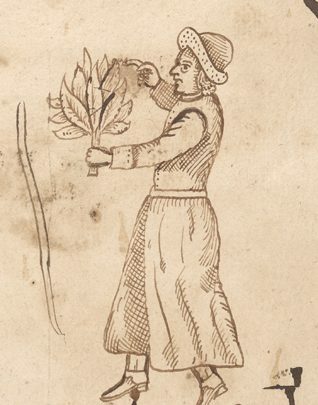 MS X893C J55 v.11 is one in a series of liturgical books acquired for the collection by Professor Richard Gottheil. This book, produced in the 18th century, contains a Passover Haggadah as well as prayers for various holidays, a wedding, and the Sabbath. 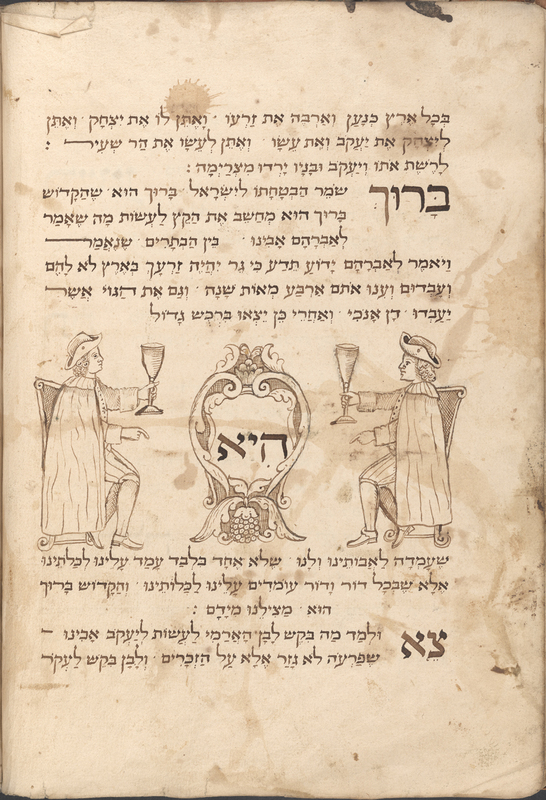 The Haggadah was well-worn and used, with lovely illustrations and decorations. 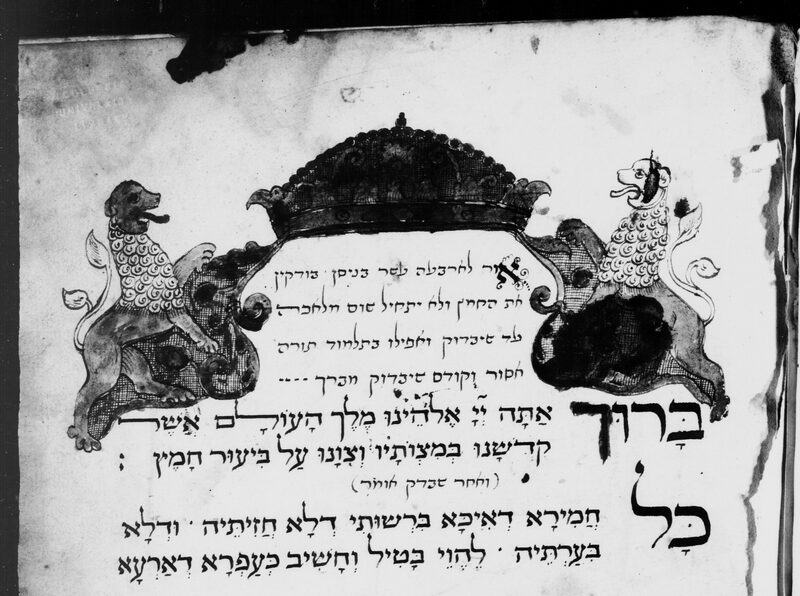 The manuscript begins with a grand illustration of two lions. 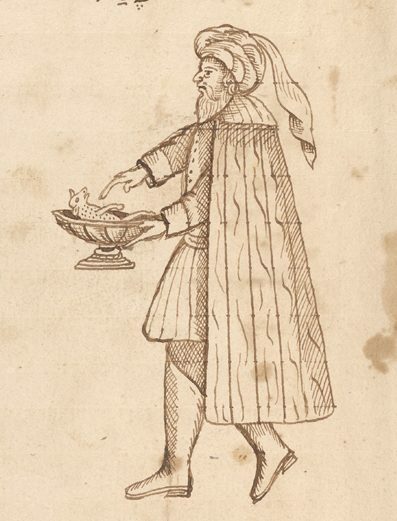 It was this preliminary image, (which looked rather dark in the black and white image,) that compelled me to take a look at the physical manuscripts, where I saw the gold leaf and color that had been used for its decoration. 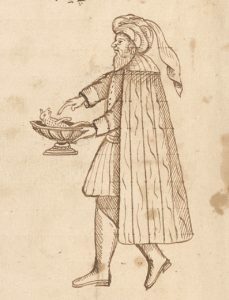 After the lions, I was treated to three men holding the main symbols of the Passover Seder: a (rather small) Pascal lamb; a (somewhat decorated) matzah; and a very large vegetable that could only have been maror, the bitter herb used to represent the bitterness of the Egyptian slavery. 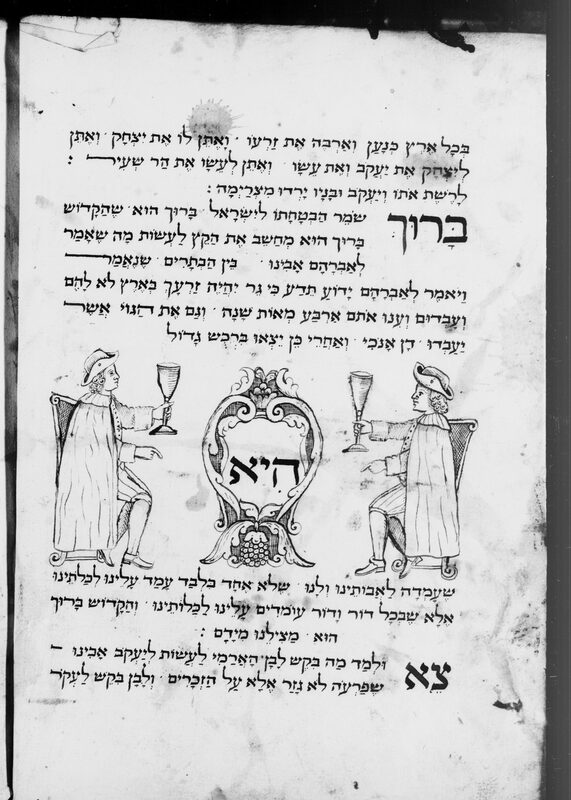 Turning some further pages, I was delighted to see what might be considered by some to be a travesty: a page covered in remnants of food and drink that had been consumed at the Passover Seder. 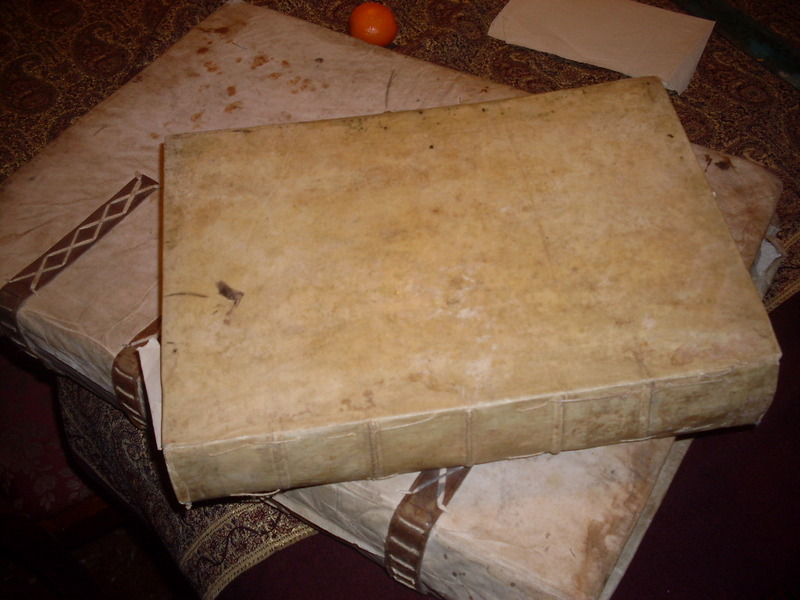 The residue of food left behind three hundred years ago has a definite aura that does not come easily when looking at a child’s dirty or sticky book in the present day. 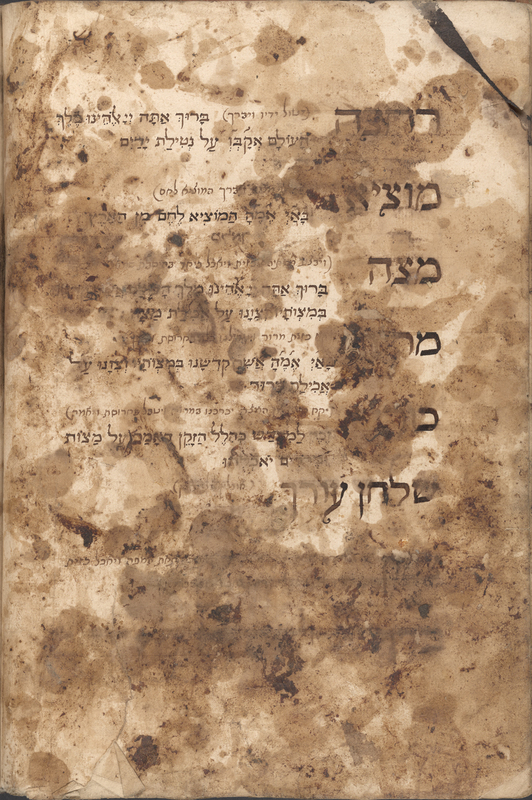 Several owners, from the de Montsales family (Avraham, Aharon, Moshe) left their marks on the pages, and so the Haggadah must have been treasured by its owners. 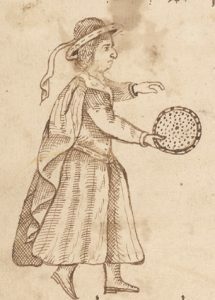 (The de Montsaleses feature in a total of five of our manuscripts from the Comtat Venaissan, from the early to mid-18th century.) 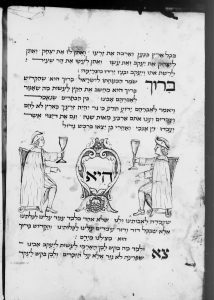 Who knows who might find inspiration in our sticky, wine and food stained Haggadot three hundred years from now?